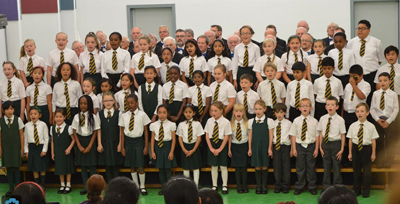 On 30th September 2015, our school choir had the opportunity to perform with the Cotswold Male Voice Choir. 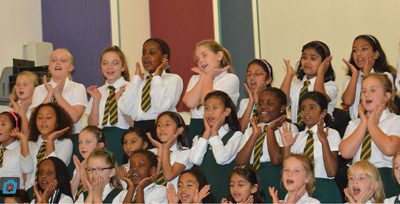 The concert was held here at school to a packed hall of parents, friends and the community. The children sang beautifully and were a credit to the school. They watched in amazement as the Cotswold Male Voice Choir performed 10 entertaining songs and then they had the chance to shine by singing a variety of songs such as Wonder by Emili Sande, 10,000 Reasons by Matt Redman and the song composed for the Queen's Jubilee, Sing by Gary Barlow. Both choirs rounded off the evening by singing together Pharrell Williams' Happy, You Raise Me Up by the duo, Secret Garden and the finalie, a rousing rendition of Oh When the Saint's Go Marching In. The concert also raised £490 which was split between the school's Mission Together charity and the Cotswold Male Voice Choir's charities.